Jicama is also known as Yam Bean, Mexican Turnip or Mexican Potato and they are now being grown in Tasmania. The taste can be described as a cross between apple, radish and water chestnut and it has a slightly fermented apple scent. Though it looks like a root vegetable it is classed as a legume as it grows on a vine. It can be eaten raw and is prized for its crisp, clean taste - it also remains crisp if cooked. 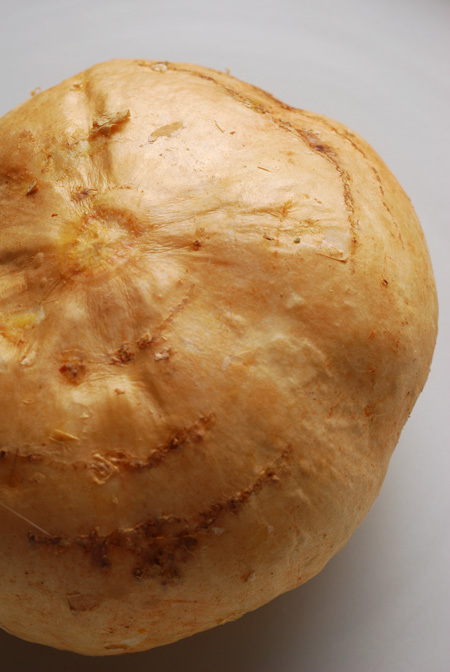 When choosing Jicama it is best to look for firm, dry specimens. Jicama contains Vitamins A, B6, C and E, Folate, Niacin, Pantothenic Acid and Riboflavin along with Calcium, Copper, Iron, Magnesium, Manganese, Phosphorus, Potassium, Selenium and Zinc. It is also low in Sodium and high in Fibre. Since this is a brand new ingredient for me I decided I wanted to make something that wouldn't hide the flavour of the Jicama and something light and fresh for summer. 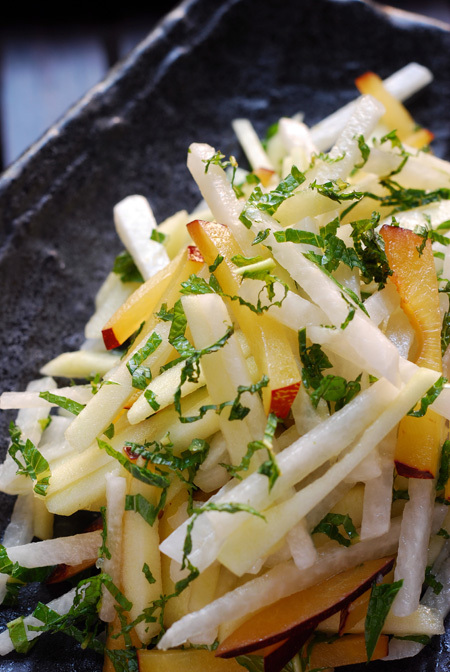 So I've come up with a really simple salad of jicama, apple, plum and refreshing mint dressed with citrus notes in the form of lime juice and orange-infused Olive oil. 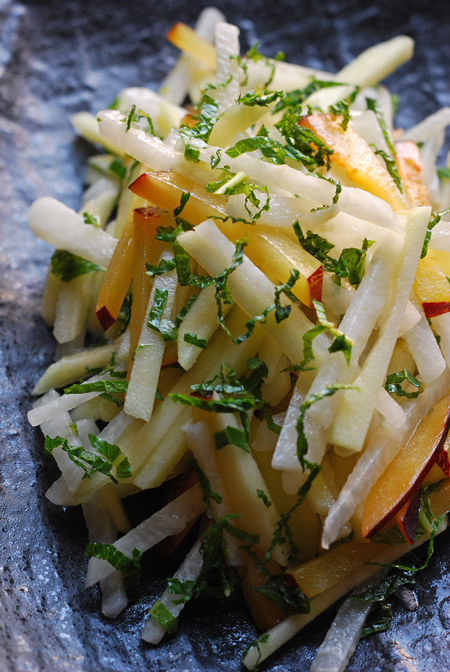 Place the Jicama, Apple and Plums into a bowl along with a generous amount of shredded mint. Toss and then season with a dressing made of lime juice and orange-infused olive oil. If you can't find orange-infused olive oil then add a little orange juice and a good fruity olive oil. Place the salad onto a serving plate and then add a little more shredded mint leaves. This makes a great companion to grilled prawns and scallops - the crispness of the salad combined with the slight tartness of the plums and dressing work well to balance out the sweet notes of seafood. Your salad looks just gorgeous. I bet it's delicious with the fruit flavors. I love the crispiness of jicama, and actually I'm making a salad today that has cabbage and jicama. I had no idea it was classed as a legume, very interesting. How delicious that looks... so beautiful and refreshing! I love jicama- amazingly it's equally good raw AND cooked, especially in Chinese stir fry dishes. What a beautiful salad! I love jicama. It's so crisp and refreshing. I just picked up a bottle of blood orange infused olive oil last week. This looks like a perfect way to use some. Thanks! Thanks Tad - i'll have to try that next time! Thanks Kalyn - i can see that it would make an excellent match with cabbage. Thanks Johanna - up until I saw them at Mow's stall in Prahran Market I didn't even think we grew them. They are a little pricey but that is to be expected with new crops. Thanks Sticky - hope you enjoy it! That looks exactly like what I wish I had with my beer this afternoon. Another of my favourite!! Lovely salad.....nice photos again!! wowo! Very jealous, Haalo! Had a craving for yam bean recently and I've been looking everywhere here in sydney! No luck yet though.. Thanks Anon - so happy to hear you enjoyed it - the vinegar sounds quite lovely too. My daughter introduced jicama to me today and I dropped by Wal-Mart on my way home to purchase my very own. The texture is most interesting and I plan to mix it with avocado in my first recipe. I think any citrus fruit will go well with jicama. It's always fun to discover something new.